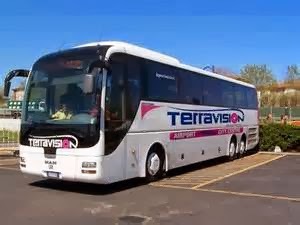 Plans for a smooth transition from Pisa airport to Florence and the return journey back to the airport at the end of our stay, were badly disrupted by the chaotic logistics of the coach operator Terravision. They are one of a number of coach companies offering a speedy 60 minute trip between Galileo Galilei airport and Florence's train station, Santa Maria Novella, and I chose them as an alternative to catching the train. A decision I regretted last week! Booking on-line, I thought, would enable me to guarantee a place on a specifically timetabled bus that would comfortably link with the arrival and departure time of our BA flights, allowing smooth tansition between plane and coach and coach and plane on return.. Terravision's published timetable was clear and the on-line booking procedures easy. I was able to print-off the return bus tickets in advance with the times of the departing journey clearly marked on the tickets. Sadly, the reality of Terravsion's operation was different. Booked on the departing 15.40 service from Pisa airport, the bus arrived at 15.55 and waited a further 10 minutes before departing, arriving in Florence at 17.10, some 25 minutes later than the timetable indicated. The bus bore no resemblance to the picture above - something of a wreck, dirty and noisy, it was a driven as if there was no tomorrow. I was relived to finally reach Florence in one piece! The return journey experience, four days later, was equally as eventful. Arriving in plenty of time at 11.15 for the 12.10 timetabled coach, we were told by the Terravision official at Novella train station that the 12.10 bus had been cancelled and there would be a bus arriving in 10 minutes. Somewhat speechless, we joined an already long queue of passengers to await the vehicle. It arrived 15 minutes later and marked the start of a chaotic dash and push to secure a place on a coach without enough seats to accommodate the massed throng of waiting travellers. Our pre-booked on-line tickets did not guarantee seats, we had to push and shove like everyone else to get to the door and to a seat! 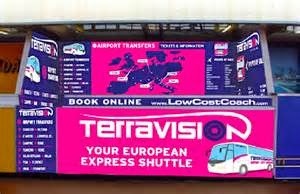 The overcrowded, noisy, dirty and dilapidated coach, again bearing no resemblance to the advertised pictures of Terravision vehicles, finally transported us to Pisa airport, but Terravision wont ever be our 'Eurpopean Express Shuttle' in the future. We will take the train - Italian trains run on time!